With a new look & nice new features, the new Intuos Pro is a step ahead in advancing graphics tablet, especially with the new feature. It may not be worth it if you own the previous Intuos Pro model, but it’s certainly a great upgrade from the much older Intuos, as well as the Bamboo or the Intuos line (the 2015 models & before). If you own a non-Wacom graphics tablet, this could be one of your options. The rough texture on The new Intuos Pro, while something some artists would like, as it imitates the way paper texture works, could also mean that the pen nib old wear up faster. Something many won’t like. Has a much smaller design, which saves desk space on your office. Has a toggle switch in the side to turn the touch feature on & off. Supports native Bluetooth, so there’s no need for the wireless kit anymore. The paper edition allows you to draw on paper with the special pen, then transfer the drawing to your computer. The pen holder doubles as a nib remover tool. The pen nibs wear faster due to the rough surface of the tablet. Comes with the Wacom Pro Pen 2 Stylus. Touch Ring:- Yes – 4 customizable functions plus home button for capturing layers in paper mode. Requires wireless via Bluetooth Classic for connecting to PC or Mac, Bluetooth LE for connecting to mobile devices (in paper mode). Paper Size for paper sketching (Large):- A4/Letter for large tablet. System Requirements:- USB port, Windowsｮ 7 or later (64bit), Mac OS 10.10 or later, Bluetooth Classic. The new Intuos Pro is the 2017 iteration of the Intuos Pro line. 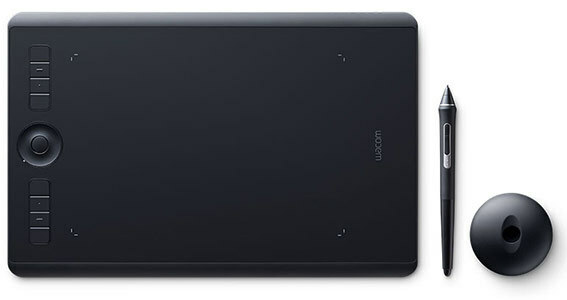 For those who don’t know, Wacom changed the name of their professional tablets few years ago, the Intuos name used to refer to their professional tablets, while they used the Bamboo name for their lower-end tablets. Today, the name Intuos Pro is their brand for professional graphics tablets, while the Intuos is for the lower-end tablets. The enhanced design of The new Intuos Pro looks lovely, it has a much smaller footprint on your office now Wacom made the tablets smaller. And now there’s a metal plate at the bottom of it, which is a quite a lovely addition. The tablets are thinner than the previous model too. particularly laptops, come with Bluetooth nowadays. I also hope this is going to be more reliable in the long run (the Wacom wireless kit wasn’t 100% reliable, but it was a step ahead at the times). Unlike the wireless kit, you can’t change the battery, which seems like planned obsolesces to me. I couldn’t find the bluetooth version required by The new Intuos Pro anywhere I looked. Being able to use your graphics tablet wirelessly is a lovely feature, while you could sure live without it, it’s very convenient not to have cables around while you draw. Think of it same as having a wireless keyboard versus having a wired one. You can still connect it using USB cable if your computer doesn’t have Bluetooth, or if it didn’t work well for you. Doing that charges The new Intuos Pro’s battery in case the battery depleted while you’re using it. The new Intuos Pro comes with the Pro Pen 2, which supports 8196 levels of pressure sensitivity, a key feature in graphics tablets that allows for the creation of thicker or thinner lines based on how hard you press the pen on your tablet. I tend to recommend to have at least 1024 levels of pressure in your device. Having more is not that important in my opinion, and so it is not a reason to get this new model on its own, but it’s nice to have if you are interested in the other features this model provides, like the paper edition features, which I will talk about shortly. The new Intuos Pro has a new dome-shaped stand, which has some spare nibs inside of it. The stand doubles as a nibs removal tool, so say goodbye to the small ring you used to remove your nibs. This is one of the small yet good additions in this new model. 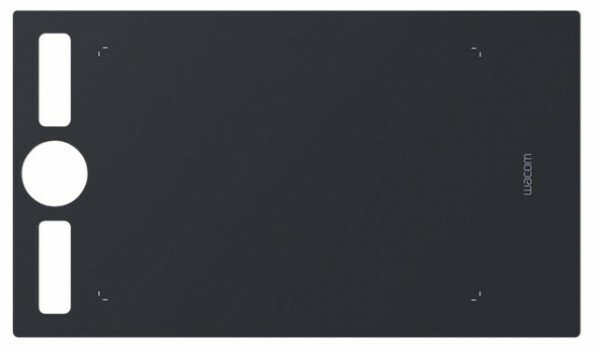 The new Intuos Pro supports some of the older Wacom accessories, like the Art pen, but to be able to use the rotation feature in it, you will loss the 8196 level of pressure, and you will be able to only use 2048 levels instead. The new Intuos Pro has a rough surface, which wears down the pen nibs faster. Since many artists don’t like that, I listed it as a con in this review, Artists who like that can ignore this part. To give people some choice, Wacom offers 3 kinds of texture sheets:- standard, smooth or rough. Which could solve the problem if you don’t like the rough texture, but it will be an extra cost for you nevertheless. Just like the previous Intuos Pro model, this new model also supports touch, including touch gestures like pinch-to-zoom & rotating the canvas. One of the common questions people ask about touch is whether it could replace your mouse or be used as a huge trackpad, the answer to that is yes, but it is not as convenient as a dedicated trackpad like Apple Trackpad. If you’re afraid that touch will annoy you or get in your way for any reason (which happens at times), you can turn off this feature with the toggle on the side and use The new Intuos Pro as a regular graphics tablet. As of the time of writing this review, The new Intuos Pro has no small model, only medium & large ones. To get a small Intuos pro, your only choice is to get the old small model. Unless you plan to carry your graphics tablet around, or you work on a small monitor, I generally don’t recommend you get that size. I am not sure if Wacom plan to kill the small size by this love. Both of the medium & large versions of the The new Intuos Pro has 8 express keys, which you could program to do all sorts of shortcuts or key combinations, as well as tough ring, you could use to zoom in & out or resize your drawing brush. The express keys are similar to the one in MobileStudio Pro (reviewed here). The new The new Intuos Pro has a special edition called the paper edition. It comes in a beautiful box that looks like book. 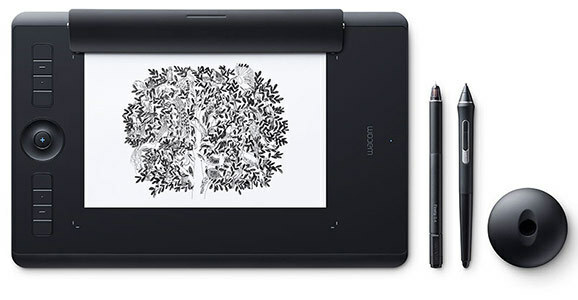 It also comes with a paper clip, which you install on the top of The new Intuos Pro, and it holds the paper on the top of the tablet, so you could draw with it using the black pen that comes with it, which you must use in order to transfer your drawing to the computer. Although you can use any kind of paper you want, as long as the paper is placed on the top of the active area of your tables (indicated by square marks on the corners). Once the black pen is close to the tablet, the ink mode activates. You can press the ring button on the The new Intuos Pro so anything you draw next is added to a new layer, which will make things easier once you move the drawing to your computer using Inkscape. The paper edition saves you time if you prefer to work on paper then transfer your drawings & sketches to your computers. As long as you could you could integrate it into your workflow. The new Intuos Pro made some good tweaks to the previous model, the smaller & sleeker design is something to be appreciated too. I totally recommend you to get The new Intuos Pro if you never had a graphics tablet but are serious about digital art in the long term. If you own a Wacom tablet, upgrading from a Bamboo & the like to the Intuos Pro could make a huge difference. If you use the previous Intuos Pro model & don’t need the paper edition features, then upgrading may not be a good idea for you. I hope you liked my The new Intuos Pro review, and see you again in another one. The new Intuos Pro (2017) VS the old Intuos Pro. What are the differences & what’s new?